God creates Eve from Adam’s rib and they have two sons, Cain and Able. Then Cain takes a wife. Did you ever stop to think about where that woman came from? Was there someone around the corner that was also doing creation? This is just one of the arguments Spencer Tracy’s famous defense lawyer character uses against his famous prosecuting attorney in the 1960 recreation of the famous Scopes trail. This damn movie, which was screened at the Dryden Theater yesterday, is sixty years old and the story it retells is 100 years old. Yet the movie is still relevant. One third of Americans don’t believe in evolution. 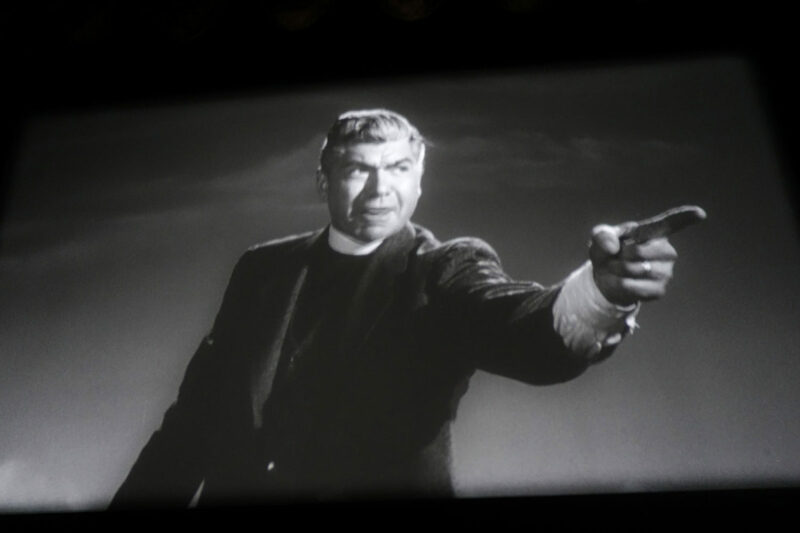 The clutches of the fundamentalists, those that believe in a literal, word of god, biblical creation story still go as deep as the Tennessee townspeople singing “Give me that old time religion,” in Stanley Kramer’s “In Inherit The Wind.” And I find that depressing. But the movie is not. The movie is vivid. It is witty. Quips fly by. Gene Kelly playing a reporter from the Baltimore Herald, lets the most fly. The smallest characters are as large life. Claude Akins is fantastic. Fredric March goes over the top. Spencer Tracy is brilliant. Distrust of science and distrust of journalism is nothing new.